Situated in the Kalahari Desert, just 50kms East of the Aha Hills, Drotsky’s caves, otherwise known as the Gcwihaba Caves, form one of Botswana’s most beautiful and unusual National Monuments, and possibly soon, UNESCO World Heritage Sites. Drotsky’s Caves are easy to miss, nestled within the undulating dunes of the Kalahari, below a nondescript low ridge of rock, however what lies beneath is quite spectacular. The Labyrinthian cav system spreads out below the area, generously littered with the most incredible and unusual stalagmite and stalactite formations. From frozen waterfalls and flowstones to mammoth obelisks of naturally formed rock, from sweeping hallways and chambers, some up to 10 metres in height, to beautiful inlets and apertures, all awash in myriad subtle colours, Drotsky’s caves demonstrate the passage of time in all it’s petrified glory. The caves were discovered by Europeans in the early 1930’s when a local farmer, Martinus Drotsky, was made aware of their existence by the local San community: the !kung. Hence for many years the caves were known as Drotsky’s caves. 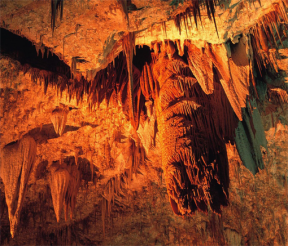 However the original name for the caverns, in !Kung is Gcwihaba, which means Hyena Hole, and evidence has been found within the cave system to indicate that the San and their predecessors have been using the caverns as a shelter and living space for thousands of years. Naturally the Gcwihaba Caves have their own eco-system complete with many species of fauna and flora for you to investigate. Most prominent, and typical of any cave system, are the bats. One can expect to find a number of different bat species, from the large Commersons Leaf-nosed Bat to the tiny Dent’s Horseshoe bat and the Egyptian Slit Faced bat, all of which are completely harmless, despite their considerable populations. You will also find tent tortoise, Ruepel’s Parrot and barking geckos, as well as barn owls, who favour the caves as their nesting grounds. The occasional porcupine, leopard and even Hyena have been known to seek shelter within the cavern maze, Hence the name Hyena Hole. Neither accessing nor exploring Drotsky’s Caves is a task for the faint of heart. Located in one of the most remote parts of Botswana, the Gcwihaba Caves can only be reached via a long and arduous 4×4 route, using well equipped 4×4 vehicles with long range petrol tanks and water reserves. There are however, a number of beautiful camping spots within range of the caves, as well as the traditional village of Xai Xai, within relatively close proximity, and the drive itself, which make the visit well worth the trip. 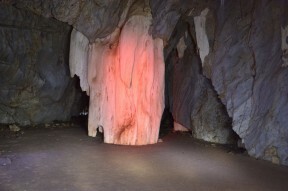 The caves themselves are extensive, and spread over 2 levels through a collection of interlinking passages and caverns. With no guides, no signs or directional indicators and no light, natural or otherwise, one needs to be pretty well equipped with flash lights, other essentials and a modicum of stamina before considering this spelunking exhibition. Once inside though, the route through the caves is relatively easy to walk, with only a few areas that require scrabbling, wiggling and scrambling and generally steely nerves. If you would like to read more information about this incredibly beautiful cave system you can look at the Botswana Tourism website or Proudly african.